Poet/actor/rapper Saul Williams gained widespread attention after starring in the hip-hop poetry film Slam, and therefore, it’s no surprise that his self-titled second album is a fusion of spoken-word pieces, DJ breakbeats, prog-rock guitars, and punk sensibility. Williams cites The Mars Volta, Cursive, Blackalicious, and Cody ChestnuTT as influences, and the styles of these disparate artists shine through on this eclectic and challenging release. A gifted wordsmith, his lyrics are full of intelligent, in-your-face politics and social commentary, and throughout the collection, Williams raps and rhymes about a variety of big ideas including gentrification, slavery reparations, and MTV’s proclivity toward the ghetto-thug subculture. The eponymous disc begins with Talk to Strangers, an artistic recitation placed over a piano loop, and while it’s not much of a song, it successfully establishes Williams as a talent much smarter than an entire cell block of his gangsta counterparts. Telegram is another poem performed over a Bad Brains guitar sample — a cool idea that might have worked had Williams taken the time to synch his rhymes with the pace of the music. One of the album’s blistering high points is Act III Scene 2 (Shakespeare) where vocals are shared with Zack de la Rocha, formerly of Rage Against the Machine. 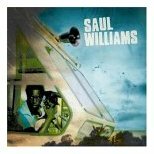 Saul Williams is available from Barnes & Noble.